A comfortable seating area in a public place where people can go to wait or relax. Lounges often include a bar, and may also serve food. 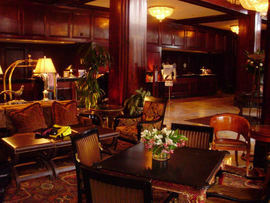 An inviting lobby lounge could be an opportunity for a hotel to make an extra profit through any food and drink it sells. The cost of building a hotel with a lobby lounge varies widely depending on size, quality, and location. A mid-priced hotel with 115 rooms and a lobby lounge can cost around $22,2 million to build.